Home Life & Non-humans What do American bullfrogs eat when they’re away from home? Practically everything! What do American bullfrogs eat when they’re away from home? Practically everything! 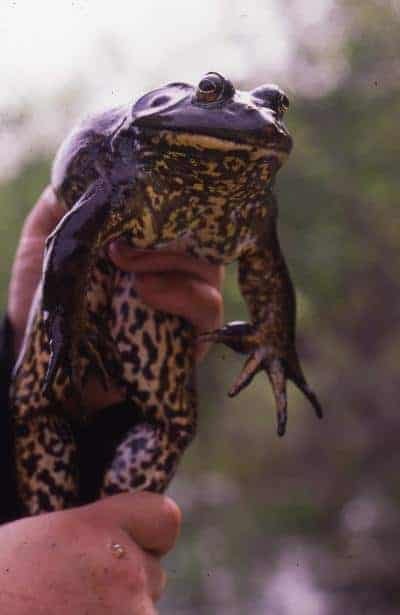 American bullfrogs are native to eastern North America but have been transported by people to many other parts of the globe, and other parts of North America, where they have readily established populations and become an invasive alien menace to native ecosystems. In the largest study of its kind to date, the stomach contents of over 5,000 invasive alien American bullfrogs from 60 lakes and ponds on southern Vancouver Island were examined to identify the native and exotic animals that they had preyed upon. The study was published in the open access journal NeoBiota. Over 15 classes of animals were reported from a total of 18,814 identifiable prey remains, including terrestrial and aquatic insects, spiders, crayfish, fish, frogs, salamanders, newts, snakes, lizards, turtles, birds, and small mammals. The study examined the stomach contents of adults and juveniles of all size-classes, but excluded tadpoles. These results show that bullfrogs will attack and consume virtually any organism that is within reach and can be swallowed, including their own species. Previous studies on bullfrog diet have examined relatively small numbers of stomachs from a comparatively small number of lakes and ponds. Our results reinforce the general consensus that there is good reason for concern about the ecological harm that uncontrolled populations of American bullfrogs might have, or are having, on populations of native species. For decades, bullfrogs have been transported and released around the world by prospective frog-farmers, pet owners, game managers, recreational fishermen, biological supply houses; and even by entrants in frog jumping contests. They adapt readily to a variety of habitats from the tropics to temperate zones and once established, their numbers grow fast with each adult female producing about 20,000 or more eggs per year. For these reasons, American bullfrogs are internationally recognized as one of the 100 worst invasive alien species in the world. Well, the celebrated jumping frog of Calaveras County ate quail shot on at least one occasion, so I’m not surprised to hear about the eclectic diet of the species….